I had so much fun talking with Shanthi Cumaraswamy Streat. 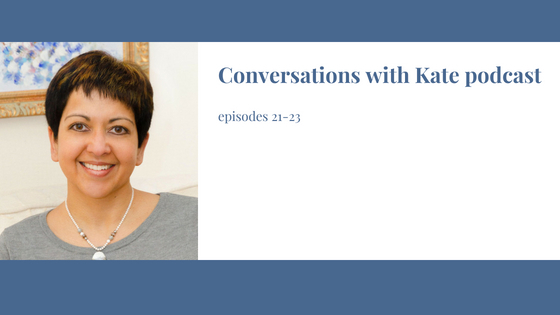 There was so much material from our conversation that I divided it into three episodes. In episode 21, Shanthi talks about her interesting upbringing in Malaysia and Italy. She was surprised that I knew something about Malaysian English and gives listeners a little demonstration. In episode 22, we talk about Shanthi’s specialty – International Business English. She gave me a whole new perspective on International English and the responsibility we ALL have for listening carefully and speaking in a way that can be understood. She also gives non-native English speakers some great tips for getting native English speakers to slow down or speak more clearly. In episode 23, we both agree that it’s important to be working with audio, video, or text that really interests you when you are trying to improve your English. Not only will it be more fun, but you’ll be learning the vocabulary and phrases that you need in real life conversations. That’s what she means when she says that “English is just the medium.” The focus should really be on the content and the language will come more naturally. We also touch on the topic of mindset. You are so much better than you think you are. See for yourself when you listen to these fun and informative conversations. I’d love to hear from you if you have comments. Please make them on my contact page, Facebook, or Instagram. If the podcasts are helpful to you, I hope you will consider supporting this work on Patreon.